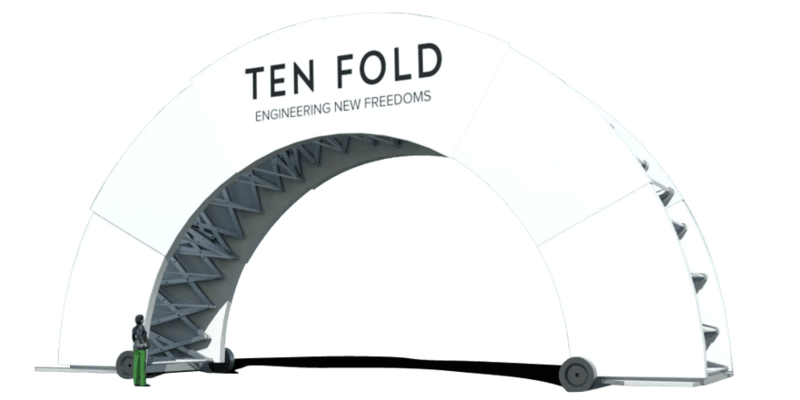 Ten Fold is a new technology that allows things to unfold and fold again quickly and easily. Ten Fold licenses its technology to people wanting to expand their horizons. Ten Fold's technology transforms the utility of everyday things. 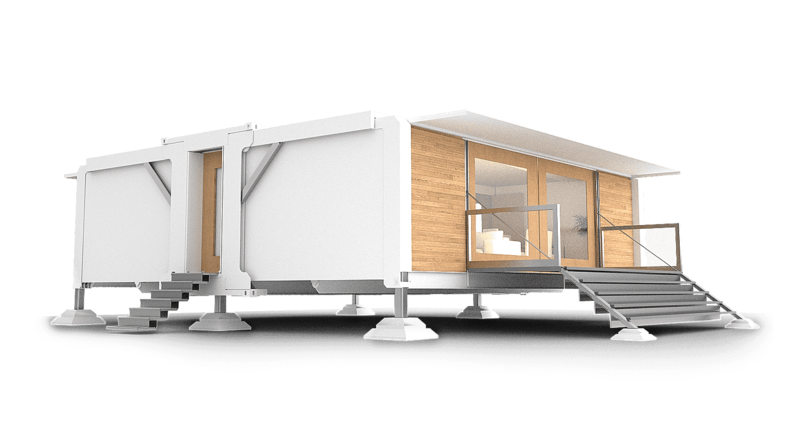 Ten Fold's technology is for people and products that move. Ten Fold licenses its patented lever-based systems to transform the shape and utility of your products. This technology allows people and the things they work with to be where they are needed. 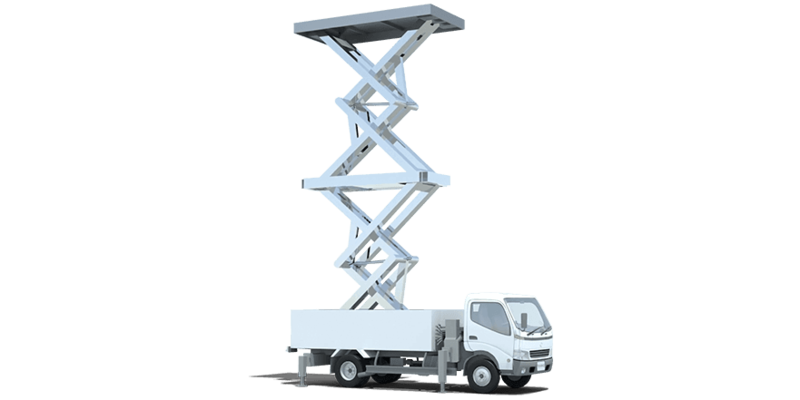 This demonstrator is operated by motor but buildings using this technology can be counterbalanced and operated manually, quickly and easily, in any location. 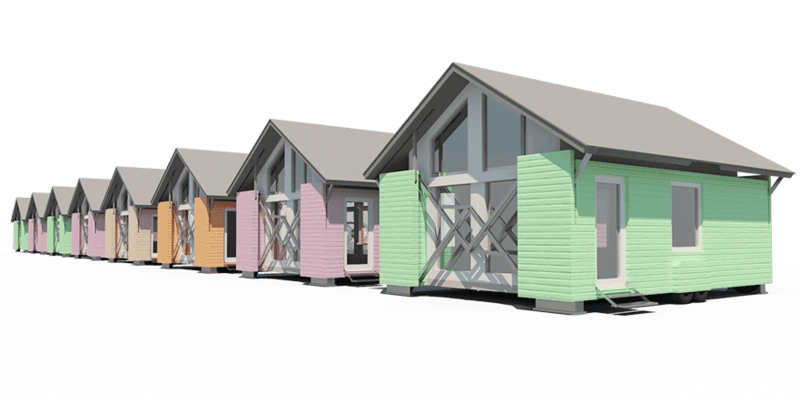 These buildings can self unload from a standard lorry. When closed for transport it has a Cargo Bay of 23 m3. 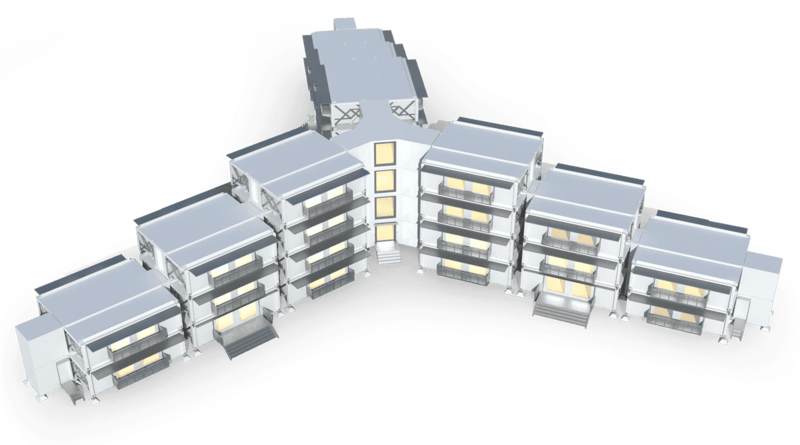 In addition this building can incorporate terraces or extra space on both sides. 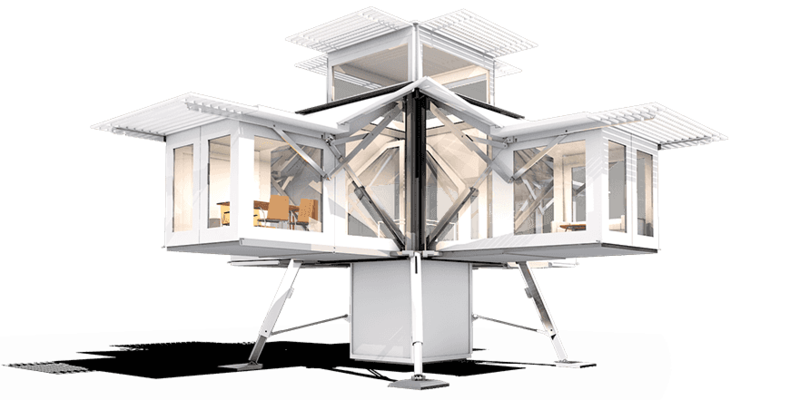 Buildings using this technology are extremely adaptable and can be constructed in many different materials and in many different sizes and styles to suit almost any application or geography. 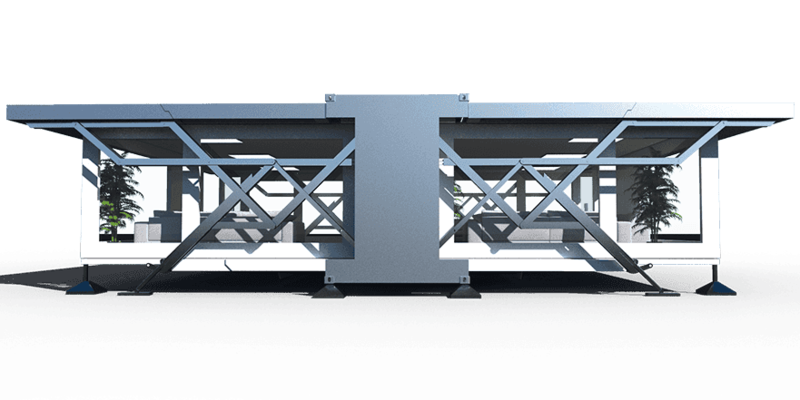 Complimentary modules can be attached to both ends to provide additional facilities such as water processing, Air Locks or extra storage space. 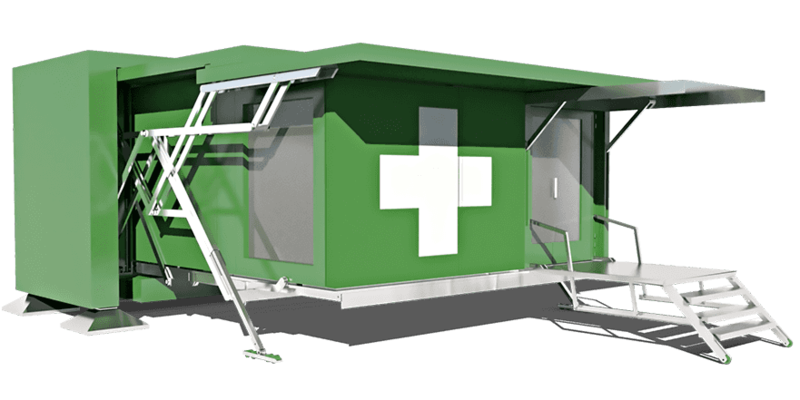 This is fully equipped, ready to use space, where and when you need it. Ten Fold technology: unfolding a new way. The TF-64 is the Ten Fold default workhorse unit. 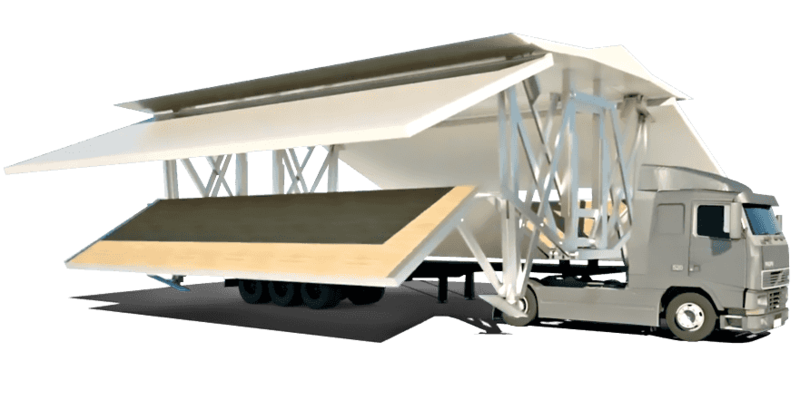 It can be transported by a standard truck. 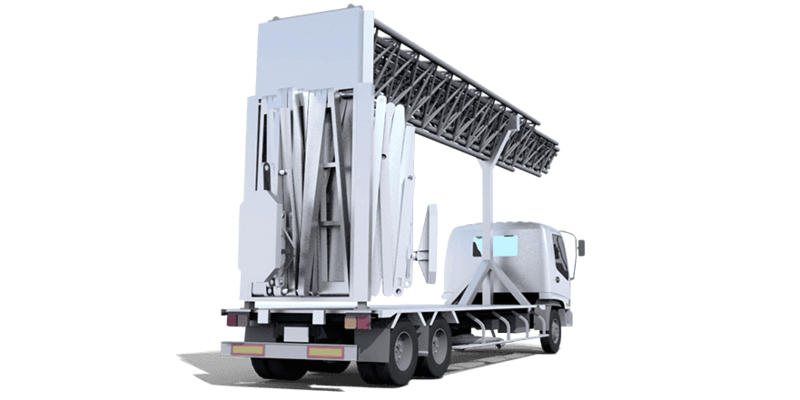 It is self-unloading and self-deploying and can be ready to use within 10 minutes of arrival. 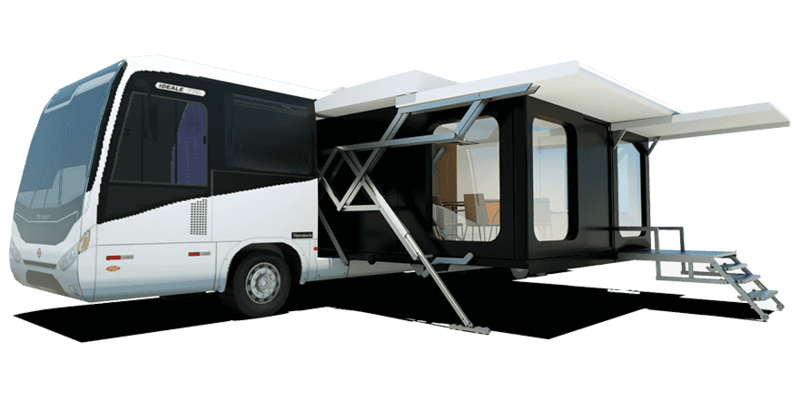 The TF-64 is built from a robust steel chassis and composite panels. 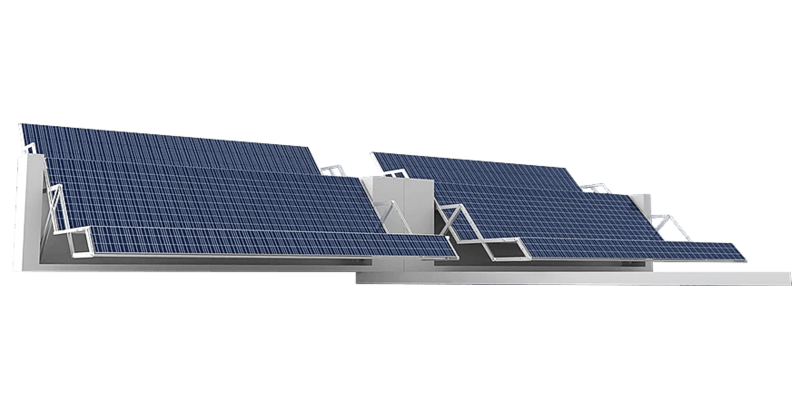 The TF-64 can be connected to an existing infrastructure or be partially or completely off-grid. 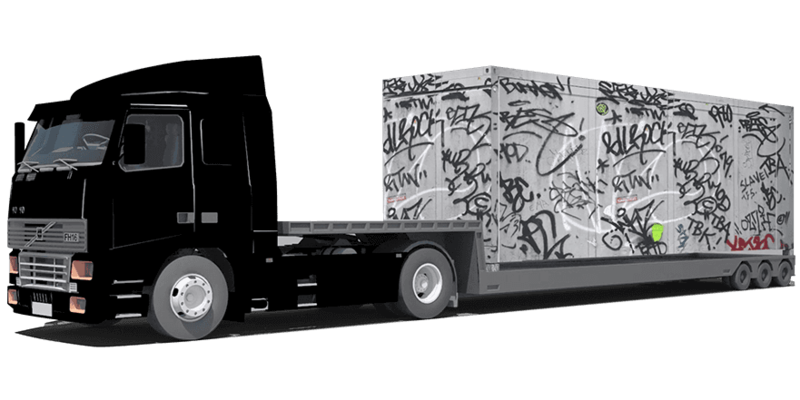 The TF-64 travels as the size of a standard high top 9m (30 ft) container. 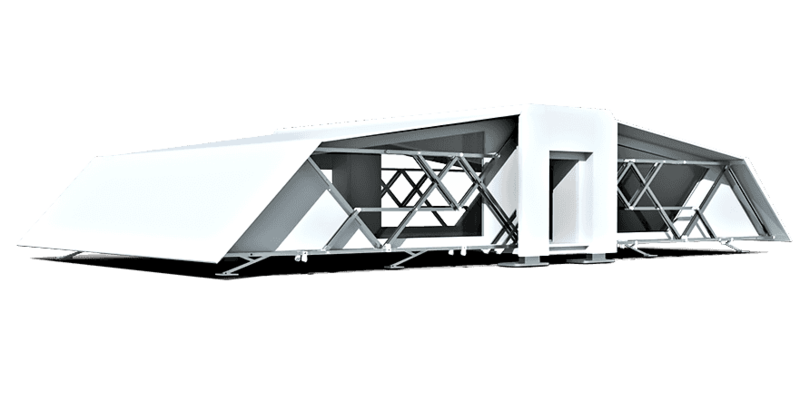 The TF-64 opens to provide approximately 64m² (688ft²) of uninterrupted space. 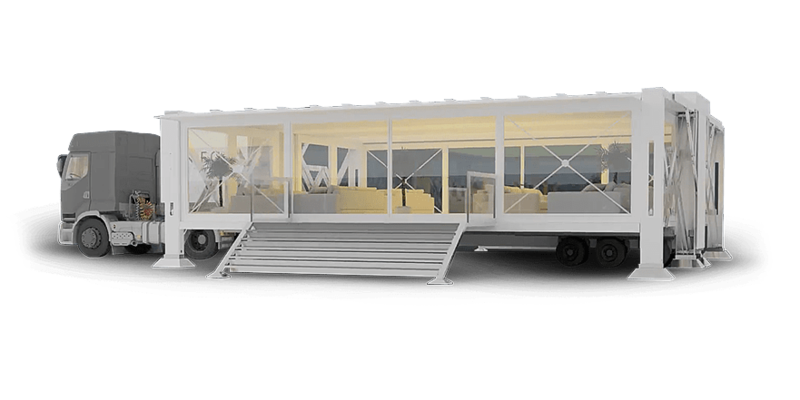 When closed the unit can carry up to 20m³ of furniture and equipment including internal walls, bathrooms, kitchens and basic furniture. Internal walls can be flexible to allow different use scenarios. 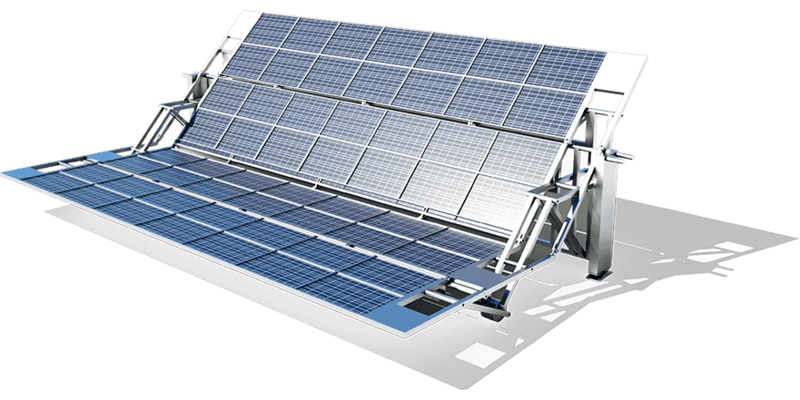 The TF-64 is designed to support additional modules such as power units, water processing and water storage. 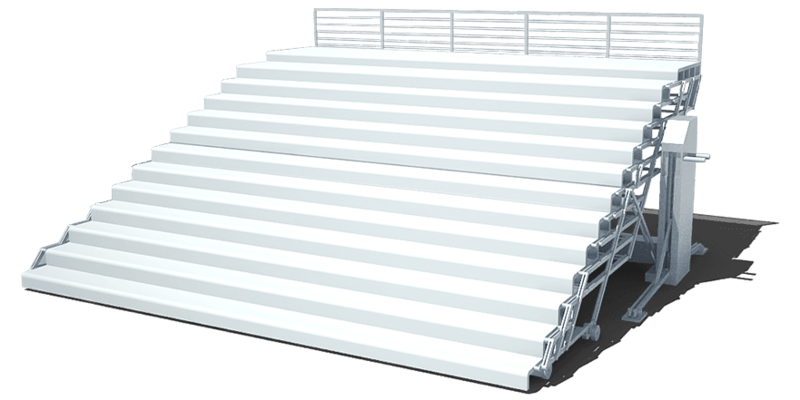 Other cassette mounted devices such as stairs, balconies and canopies can be attached to the sides of the unit. 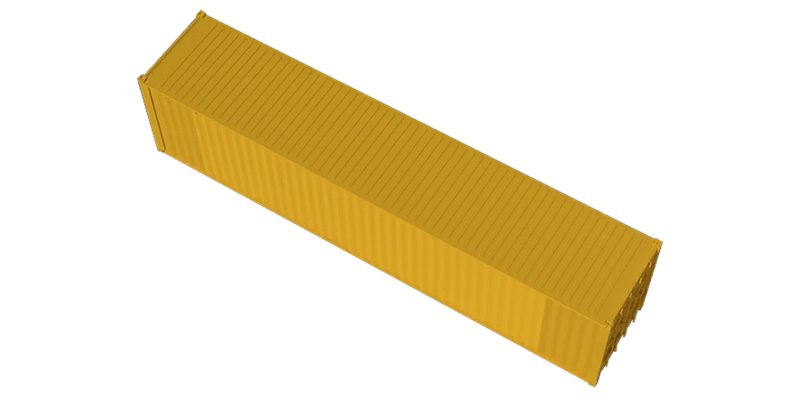 These units can be stacked and interconnected in almost any way. The side and end panels can be solid or glazed and ‘branded’ in any way. 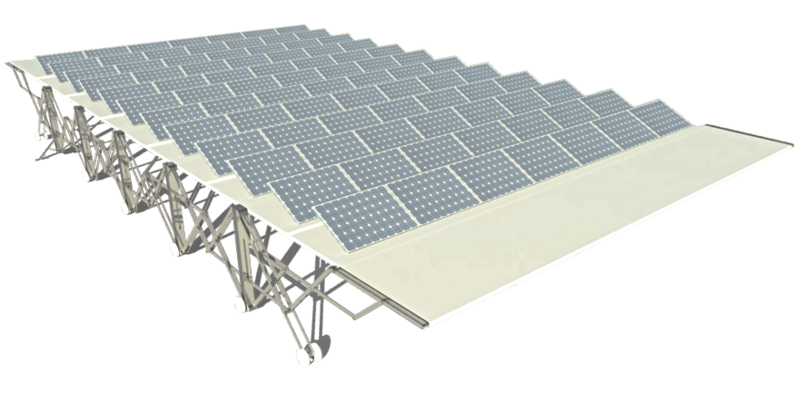 This model is fully engineered and defined and ready for adaption to mass-manufacture. 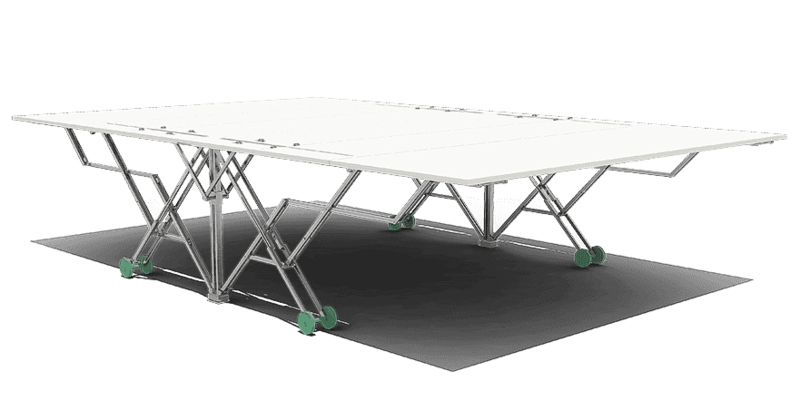 Ten Fold’s family of counterbalanced folding linkages are designed to bring mobility, speed, ease and reliability to your products and services. TEN FOLD’s lever-based IP is simple, but it underpins an amazing variety of extremely useful mechanical movements that confer advantage on the products that use it. 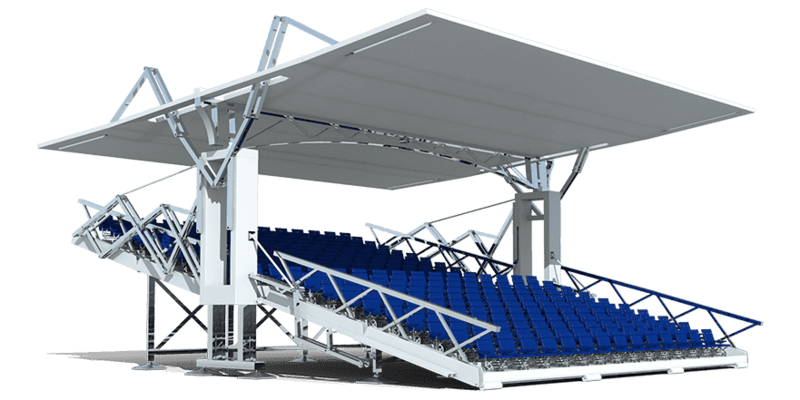 Ten Fold devises, develops and owns the rights to its counterbalanced lever systems, patented folding technology and assembly ‘know-how’. 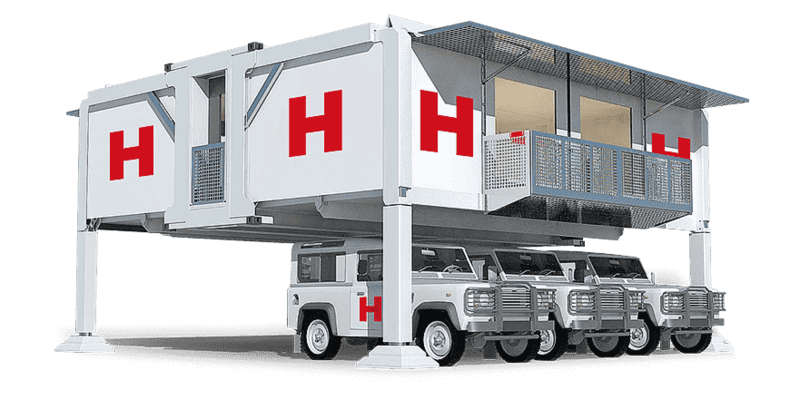 The Ten Fold system allows relocatable buildings and other structures and devices to fold to a smaller size so that they can be moved more easily. They operate without complex drive systems and use very little power. There are limitless applications for Ten Fold technology because it reduces cost and complexity, making the products that incorporate it easier to use, more adaptable and more accessible to more people. 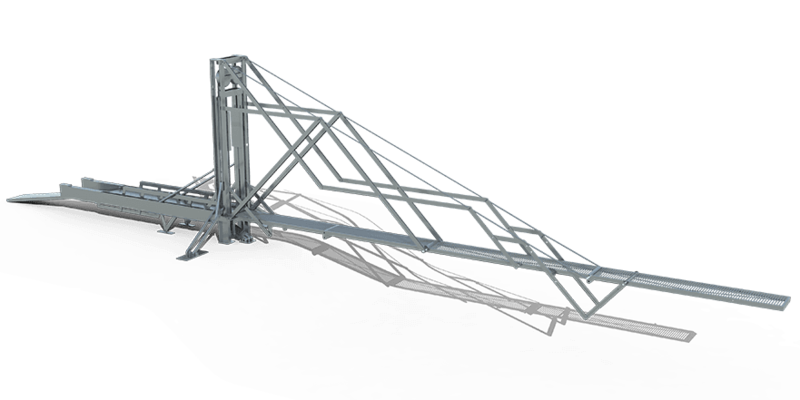 Ten Fold Engineering Limited has devised a ‘family' of pin-jointed linkages that perform specific useful movements repeatedly, precisely and reversibly in such a way that they can fold up, with each element counterbalancing the other so that very little power is needed to drive them. All the linkages can be driven by almost any one of the individual bars of the linkage. This gives them extreme versatility and flexibility in all applications and obviates the need for complex locking and feedback systems. In addition, any bar of the linkage can be the fixed bar, offering yet further choice over the shape formed, or the direction taken, by the linkage or anything attached to it. As a result, and depending on their orientation and the choice of the fixed bar, physically identical linkages can form movements that appear radically different. In the images below, the three structures use identical linkages. 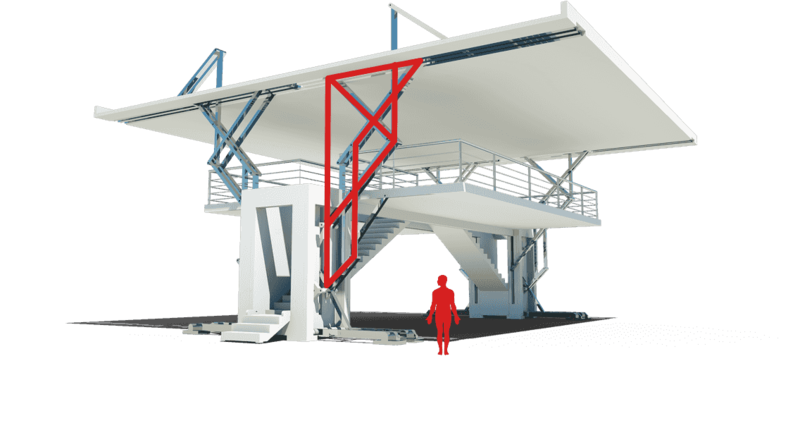 However, the canopy is an inversion of the bridge linkage and the double height canopy uses the end linkage as the fixed bar. 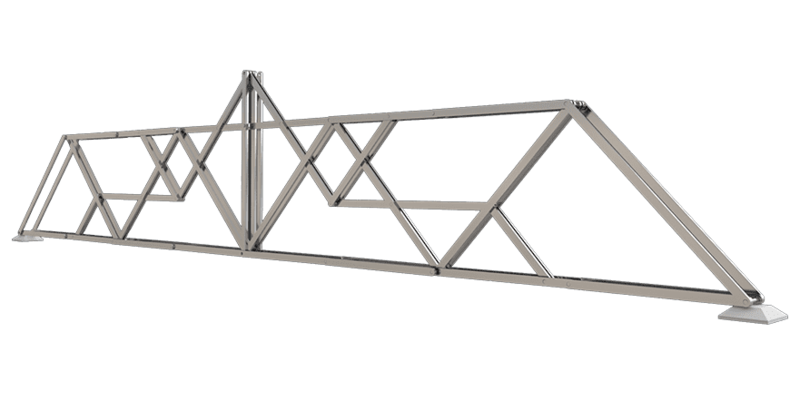 The length of the individual bars of the linkages can be changed to form very specific movements but Ten Fold has devised and applied a geometry that allows a large and practical range of movements using only three different lengths of bar. This modular approach makes the system very flexible and affordable, and the parts interchangeable. 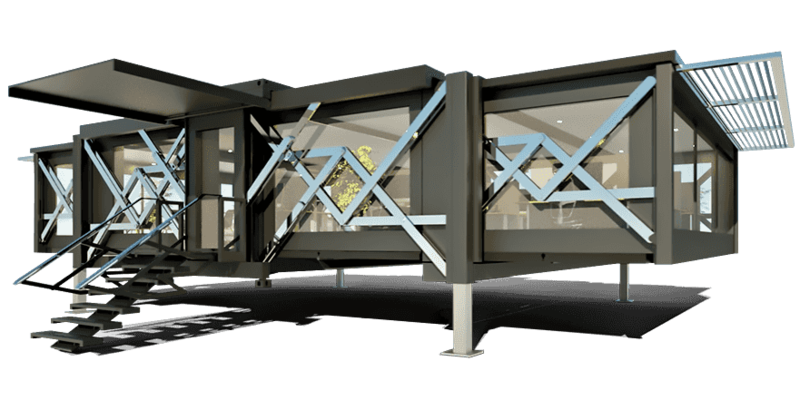 There is virtually no limit to the range of movements or the size of the structures that these linkages can support beyond the limitations of the materials they are composed of and if constructed properly they function equally well using metal, plastics or even timber. The linkages themselves can be combined with others and drive each other and form straight or circular movements, and fractals. 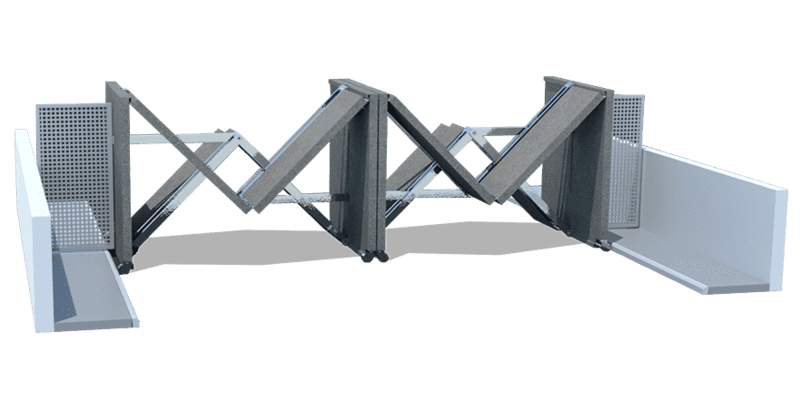 These pin-jointed linkages can be designed to be self-triangulating in the locked out position allowing them to perform stable structural shapes like beams and bridges when unfolded but still re-fold to a very compact configuration for convenience, ease of transport or ease of storage. The individual bars of the linkages and the objects they drive or carry can be changed in weight to form almost perfectly calibrated counterbalanced systems or, in the case of several of the building designs, the linkages are calibrated to have a tendency to move in one direction, which simplifies the drive system. Ten Fold linkages are the only practical linkages that can fold virtually flat but extend in a straight line to multiples of their height without requiring complementary support and without any part of the linkage itself preceding or obstructing the passage of an object fixed to it. Another quality of the linkages is that although they follow slightly curved paths, when placed back to back they can form geometrically perfect straight lines. This latter quality, which is exemplified in some of the designs shown in this website mean that the linkages can be used at micro or macro scale in anything from bridges to precision instruments. Ten Fold linkages can be licensed. 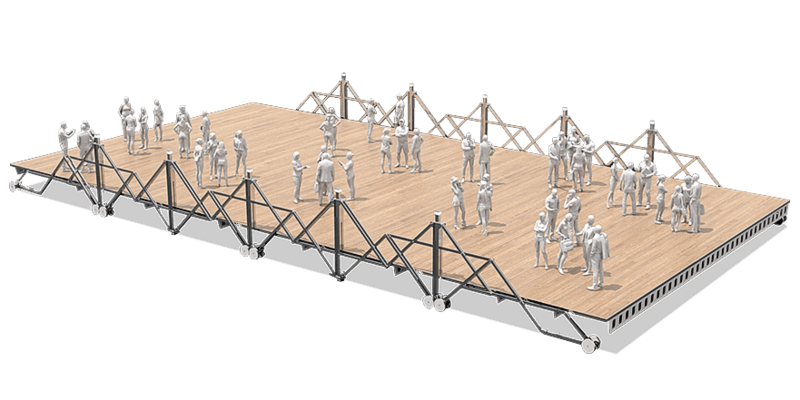 TEN FOLD’s linkages drive and guide the unfolding of the floors and side walls simultaneously allowing them to deploy extremely quickly and reversibly, using surprisingly little power. 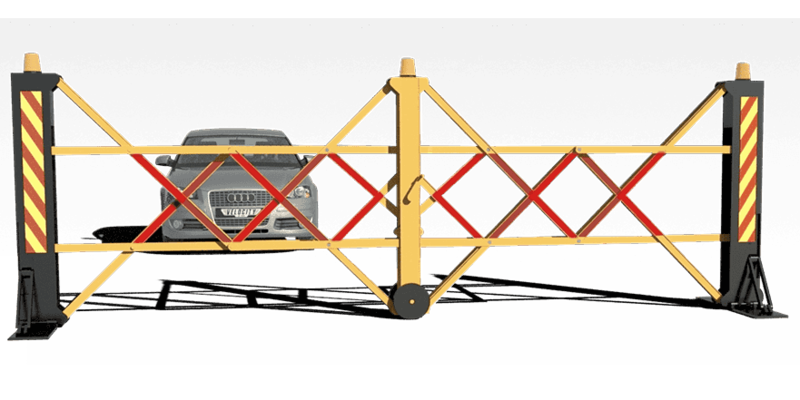 The linkage system is composed of simple components without hydraulics, complex locking mechanisms or feedback systems. 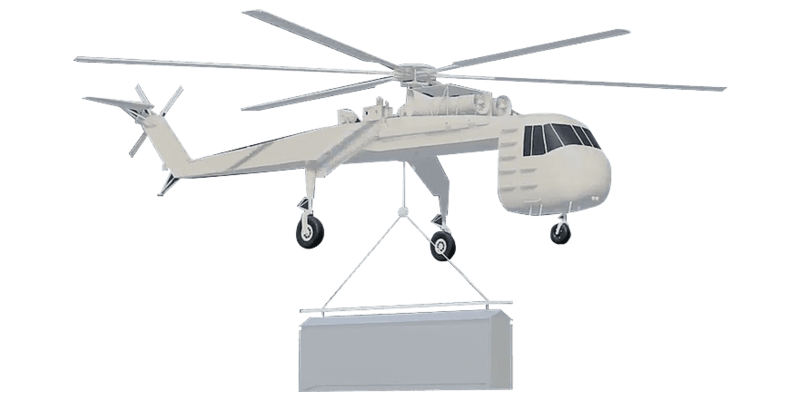 The linkages allow hitherto unachievable lateral extensions of the sides of the unit, substantially in excess of the height of the units and to almost double the distance of other market alternatives, allowing real-scale space to be delivered from a readily mobile and easily handleable unit the size of an iso container. 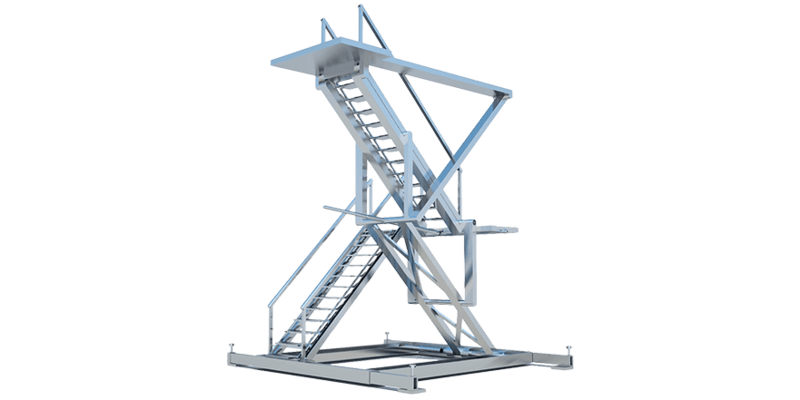 Adjustable legs and outriggers allow the units to be deployed safely anywhere they are required, on unprepared, sloping or uneven ground. 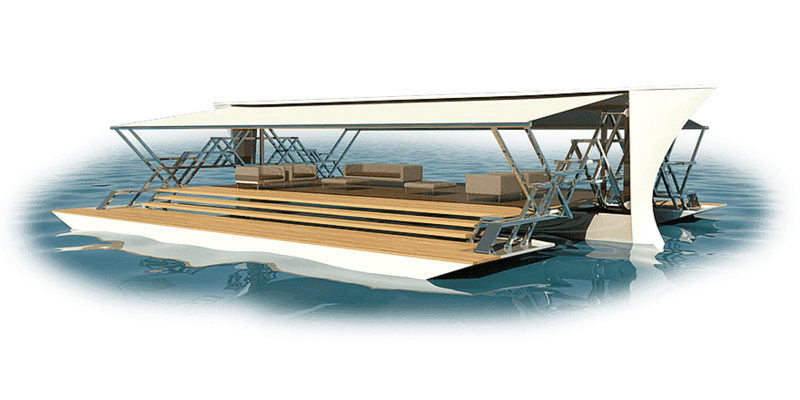 All the expansion occurs from the central chassis thus requiring only a modest footprint of firm ground. No site power supply or complementary machinery or labour is required. 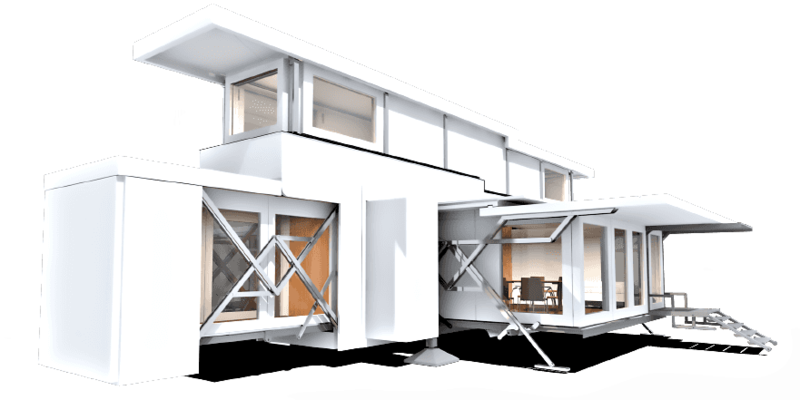 TEN FOLD units are robust and resilient, long-life, well-insulated buildings designed to be moved and moved again but with the design and performance characteristics expected of a solid building. 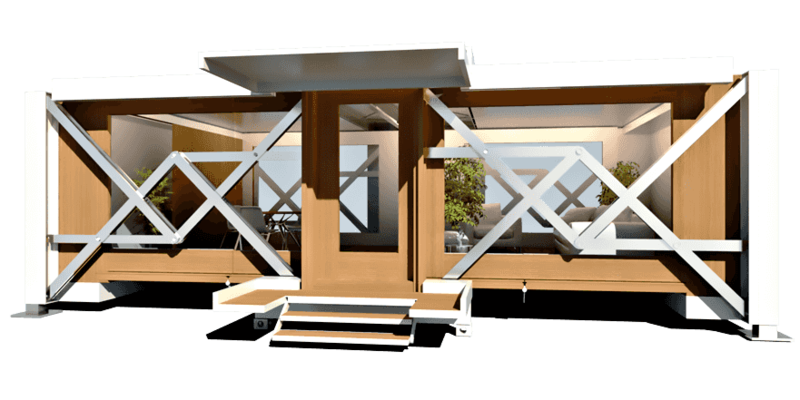 The units can be built to international standards and designed to comply with the broadest ranges of construction codes. 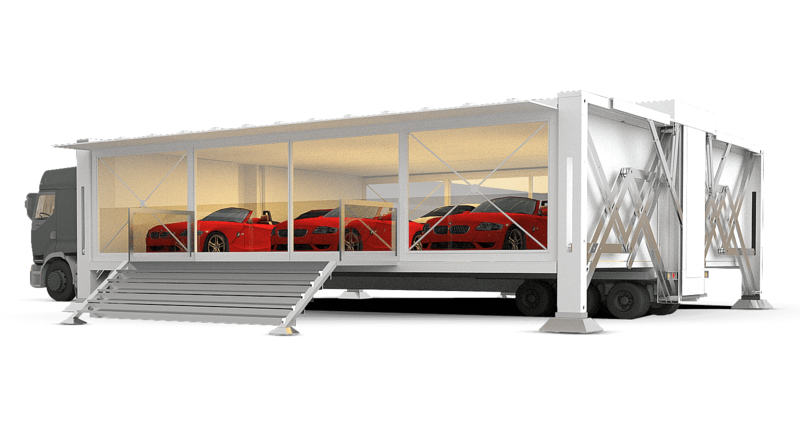 The units are comprised of only three components: the chassis, the panels and the pods. All services are cassette-mounted so there is no hard-wiring or plumbing. Most components can be replaced without disruption to any other, ensuring easy and economic maintenance and upgrading and low redundancy. 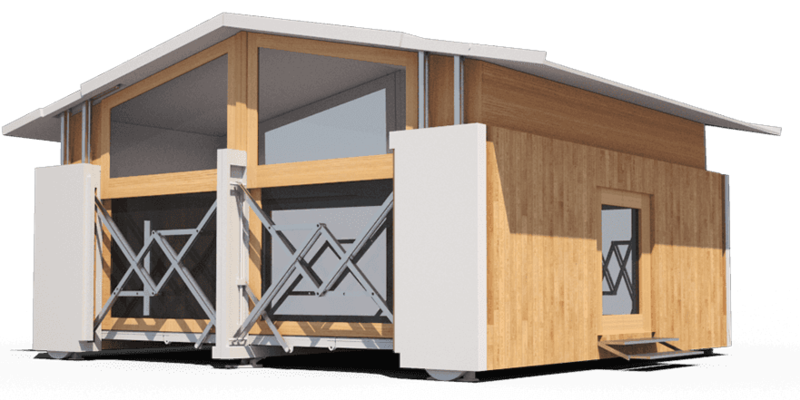 TEN FOLD units are ecological and sustainable and offer a credible and environmentally non-destructive alternative to traditional forms of land occupation, allowing reversible land development. 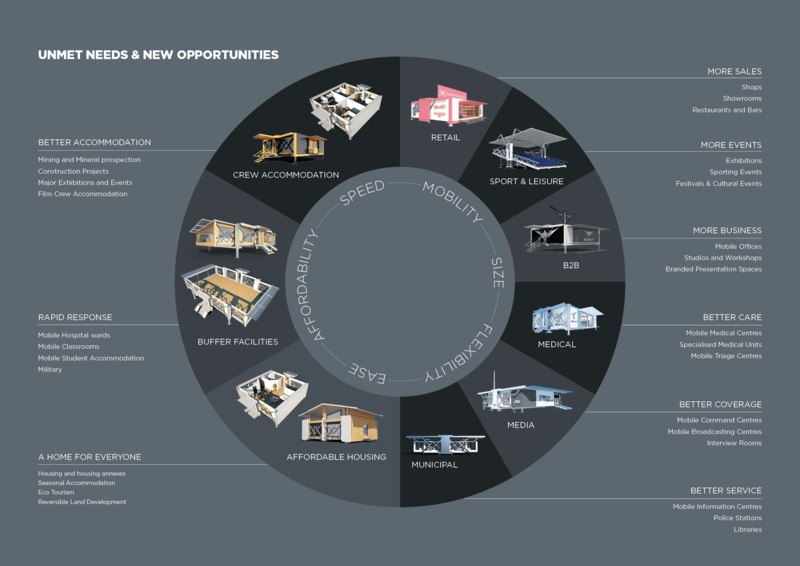 TEN FOLD units can meet modern BREEAM and LEED energy, material and production sustainability standards. 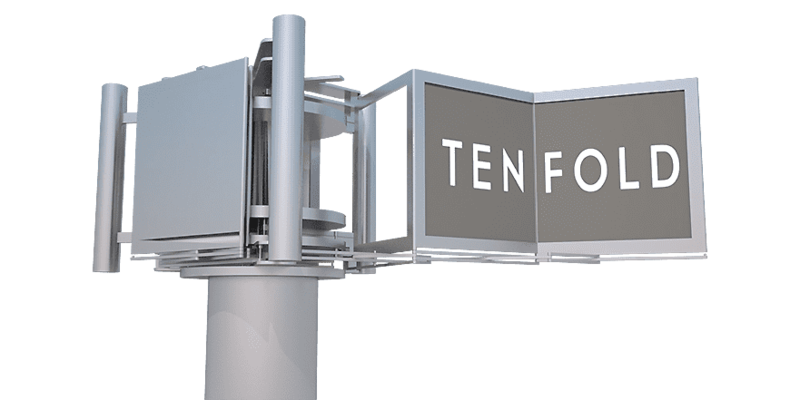 The TEN FOLD design team are committed to the principle of constant value-engineering to simplify and optimise the performance of each component. Most components in TEN FOLD units are exchangeable and multi-functional, reducing the number of parts, increasing system efficiency and reducing waste. This technology, with its standardised components and modularity options will inevitably lead to cheaper products, lower operating costs, less waste and redundancy and higher residual capital value. 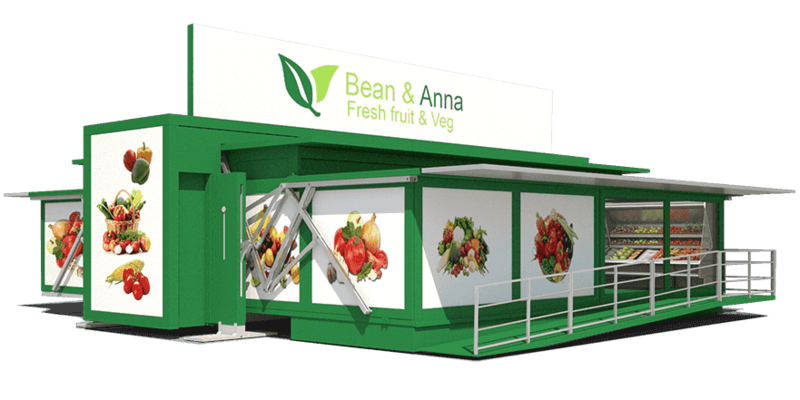 Ten Fold Products are Transportable Property Assets. No plant required at delivery point. Reduced build & break times. One unit with multiple uses. More space from fewer trucks. Workspace and tools in one place. Less infrastructure on short term sites. Ten Fold technology is too relevant to ignore and too big to contain. It is a new approach, a conduit for change and a vector for opportunity. We want to bring it to those for whom it will make a real difference. So, we are licensing it so people can access better solutions at fair prices. 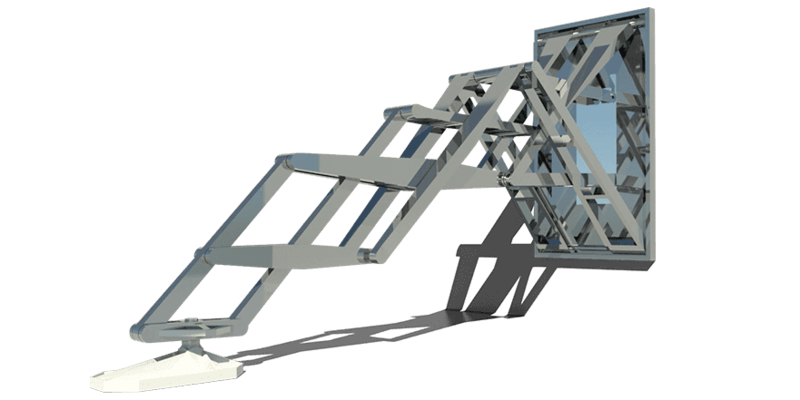 All the designs featured on this website show practical examples of applications of our lever systems and folding ‘Know-How’. They are not fantasies, they are engineerable realities that resolve technical and commercial challenges in a simple and effective way, allowing people and the things they need, to be where they are needed, when they are needed. 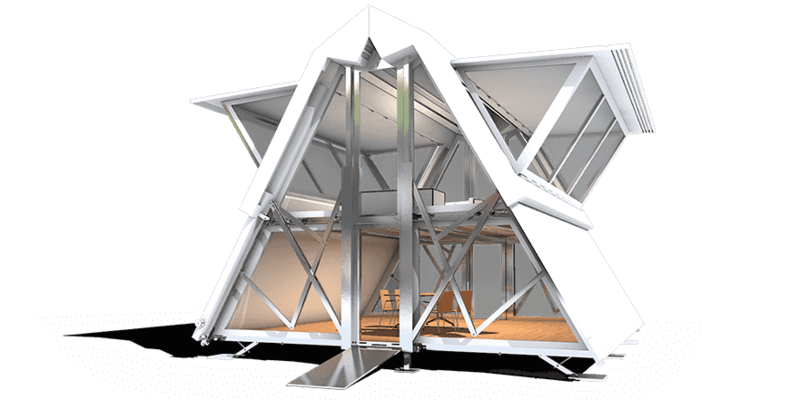 This website shows only a small selection of our folding and expanding systems but this technology has applications across all sectors from buildings, structures and machines to medical devices and space exploration. 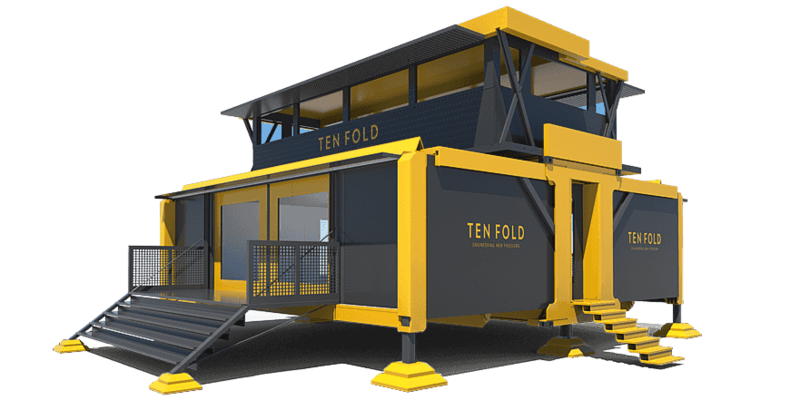 Ten Fold wants to engage with you to help you embrace this technology so that you can be more agile, save time, do things faster and more efficiently whilst making better and less destructive use of land and other resources. We welcome anyone who wants to be a Ten Fold Licensee. This is an agreement to build or have built products that incorporate Ten Fold IP and ‘Know-How’. The terms of the Ten Fold Technology License Agreement and details of the Technical Support Services we offer are available on request. We don’t want people to have to wait for our products so we want to create a network of approved manufacturers to service product demand. The terms of the Ten Fold Approved Manufacturer agreement are available on request. You will shortly be able to buy Ten Fold units via our network of approved manufacturers. As our Engineering team expands we will also be able to offer a full design and customisation service. 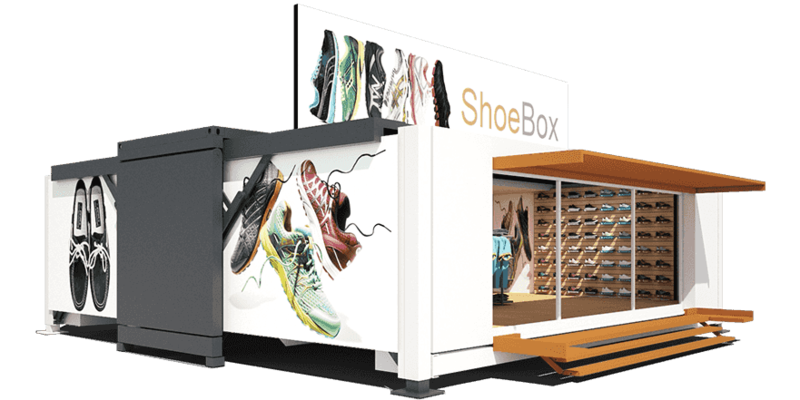 We are able to partner you in developing your own version of any of our designs or even exclusive products of your own design that incorporate Ten Fold Technology. www.tenfoldengineering.com is a site operated by Ten Fold Engineering Limited ("We"). We are registered in England and Wales under company number 07341960 and have our registered office at Silbury Court, 420 Silbury Boulevard, Milton Keynes, MK9 2AF. Our main trading address is The Old House, Northend, Batheaston, Bath, BA1 8ES. Our VAT number is [VAT NUMBER]. 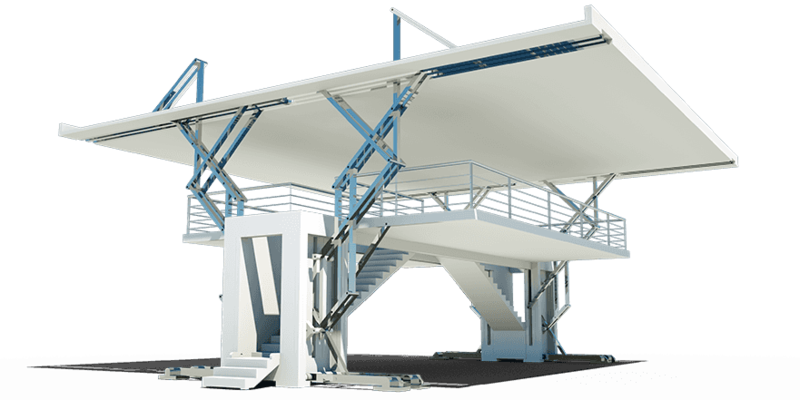 To contact us, please email info@tenfoldengineering.com. TEN FOLD ENGINEERING LIMITED ("We") are committed to protecting and respecting your privacy. This policy sets out the basis on which any personal data we collect from you, or that you provide to us, will be processed by us. Please read the following carefully to understand our views and practices regarding your personal data and how we will treat it. By visiting www.tenfoldengineering.com you are accepting and consenting to the practices described in this policy. For the purpose of the Data Protection Act 1998 (the Act), the data controller is Tenfold Engineering Limited of The Old House, Northend, Batheaston, Bath, BA1 8ES. Information you give us. You may give us information about you by filling in forms on our site www.tenfoldengineering.com (our site) or by corresponding with us by phone, e-mail or otherwise. This includes information you provide when you register to use our site, subscribe to our service, search for a product, participate in discussion boards or other social media functions on our site and when you report a problem with our site. The information you give us may include your name, address, e-mail address and phone number, financial and credit card information, personal description and photograph. Information you give to us. We will use this information: to carry out our obligations arising from any contracts entered into between you and us and to provide you with the information, products and services that you request from us; to provide you with information about other goods and services we offer that are similar to those that you have already purchased or enquired about; to provide you, or permit selected third parties to provide you, with information about goods or services we feel may interest you. If you are an existing customer, we will only contact you by electronic means (e-mail or SMS) with information about goods and services similar to those which were the subject of a previous sale or negotiations of a sale to you. If you are a new customer, and where we permit selected third parties to use your data, we (or they) will contact you by electronic means only if you have consented to this. If you do not want us to use your data in this way, or to pass your details on to third parties for marketing purposes, please tick the relevant box situated on the form on which we collect your data; to notify you about changes to our service; to ensure that content from our site is presented in the most effective manner for you and for your computer. If Tenfold Engineering Limited or substantially all of its assets are acquired by a third party, in which case personal data held by it about its customers will be one of the transferred assets. If we are under a duty to disclose or share your personal data in order to comply with any legal obligation or to protect the rights, property, or safety of Tenfold Engineering Limited, our customers, or others. This includes exchanging information with other companies and organisations for the purposes of fraud protection and credit risk reduction. You have the right to ask us not to process your personal data for marketing purposes. We will usually inform you (before collecting your data) if we intend to use your data for such purposes or if we intend to disclose your information to any third party for such purposes. You can exercise your right to prevent such processing by checking certain boxes on the forms we use to collect your data. You can also exercise the right at any time by contacting us at The Old House, Northend, Batheaston, Bath, BA1 8ES. We licence our technology to create opportunities for new approaches, new designs and new engineering solutions in all markets. There has been an unprecedented positive response to Ten Fold technology posted online recently. It is clear that everyone can benefit from the agility and flexiblity that Ten Fold technology offers. But different people in different countries and regions have different needs and differing capacities to achieve them. The quickest way to meet the scale, urgency and variety of the demand we have seen is by licensed manufacture. 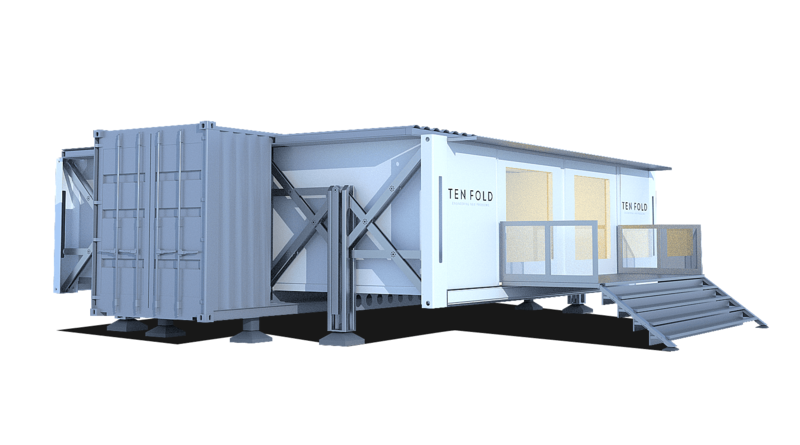 Ten Fold technology is easy to build and assemble and many existing factories will be able to adapt to produce it. Local and regional manufacturing will bring the product closest to where it is needed and promote employment. We invite manufacturers interested in using our technology to contact us. If you would like to know more about our global product development, manufacturing and licensing opportunities, please get in touch. We're sorry, something went wrong while submitting the form, please try again or alternatively send us an email.